I haven't talked much yet about what happened last Friday. I didn't have much to say and I said everything I knew, which was nothing more than what everyone else knew already. I don't want to judge anyone, nor have I ever wanted to, because I don't have the knowledge to do so and after all, that's why we have the courts for. There's a lot of people doing that and it's a waste of time. Since time is related to money, losing time also means losing money and in this blog you won't hear of any strategies about how to lose money! What I'm really interested about here, is instead of judging those involved, to try to understand what is really going on and what is the best strategy to optimize the profit, while minimizing the loss. I have seen some optimistic people that didn't make any cashouts and a majority of pessimistic people that cashed out all their bankroll and cannot play now. If you belong to the second group, stop sending me messages on facebook asking for money, if it's not good for you to play with your own money, then it certainly isn't good to play with mine! According to my experience in this world, the optimists are more successful than the pessimists. It's not that hard either, cause the pessimists don't usually come from the same place... However, the pure optimists are not the most successful group. Pure pessimism and pure optimism are both a form of gambling, because life can take different directions and bets on only one are risky. Someone very successfull in life often says to me: "Don't put all the eggs in one basket" and he talks from experience. Those who are the most successful are the optimists that take the necessary precautions and are prepared for both when things go well and for when they go wrong. But what does all this have to do with poker? After thinking a lot about the subject, I reached the conclusion that nowadays it's not necessary to have all of one's bankroll in one place. Let's be honest... If we play with 100+ buy-ins, how often do we actually need the last 50 buy-ins? If you are winning players, that is quite rare, trust me! Today, with all the e-wallets that are available, neteller, moneybookers, etc Why not have 25-66% of the bankroll in one or more e-wallets, bank accounts, etc and only use that money when it's necessary? Maybe it will take a couple of days to transfer everything if it's a lot of money, but... if I lose 50% of my bankroll, I'll stop playing for some days anyway, so there's no problem. This way, one can prepare for the "Apocalypse" and be able to resume playing anyway. I have already made some cashouts, but I have enough $t money in my account to play. When I want to convert $t into $, I just need to spend some days playing regular sitngos, with the volume that I play I convert fast, but... it's not the time to do that and the $t is only a part of my bankroll that's on the site. Did you cashout all of your bankroll? Good news for you! There's a deposit bonus of 50% up to $200. Apart from the free $200, what else is there on PokerStars? If you play mtts, that equals 33% of cashback! To put it in another way, you play 3 Bigs of X value and you win a ticket for a tounament of X value of the scoop. "EzMoney"! 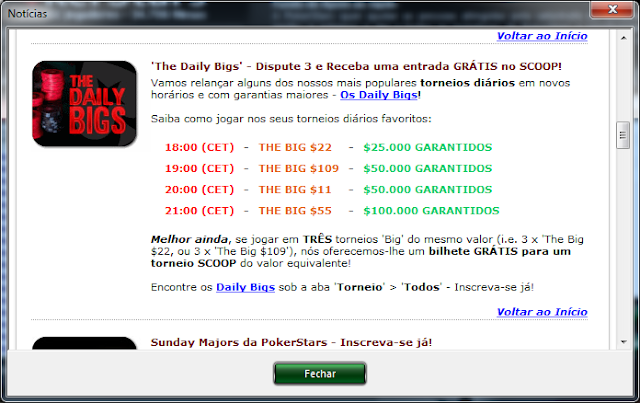 Whoever follows my portuguese blog, knows that last Sunday before I started playing, I said that I thought it was a great time to play on Pokerstars, because since there were no regulars, the ratio fish/shark would be much more favorable and with the situation of the cashouts there would be lots of people playing bad. 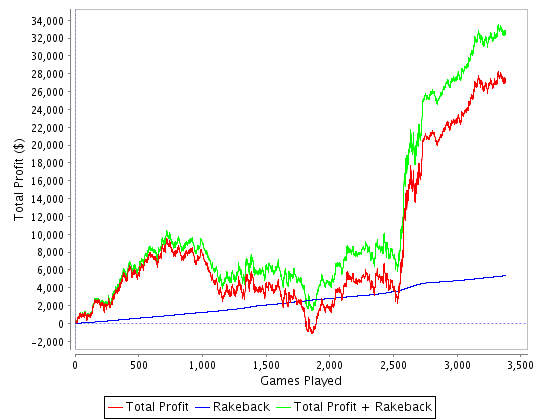 I played as much as possible and the highest stakes they had (and that my bankroll allowed). I came back from Vilamoura on Saturday, and on Monday, Tuesday and Wednesday I played until late. Every day I would go to the gym in the morning, feeling very sleepy, but when I came back I played more anyway. Results, other than being exhausted? Like I said on Sunday before starting my session, I thought that it would be a very prosperous period for me. What have you done since Friday? P.S. : Another advantage of not having all the money in one place is that when the reload bonuses come up, you always have money available to deposit. I talked with my girlfriend about my english blog sittuation and we concluded that the only person that could actually translate everything from my portuguese blog to this blog and keep it up to date was my girlfriend. She was the one translating it before and she will keep doing it on her free time. Thank you Katerina for the translations! Also need to thank other people for helping with this blog. Thank you Neil Stoddart for the photo on the top! New deposit bonus on pokerstars! 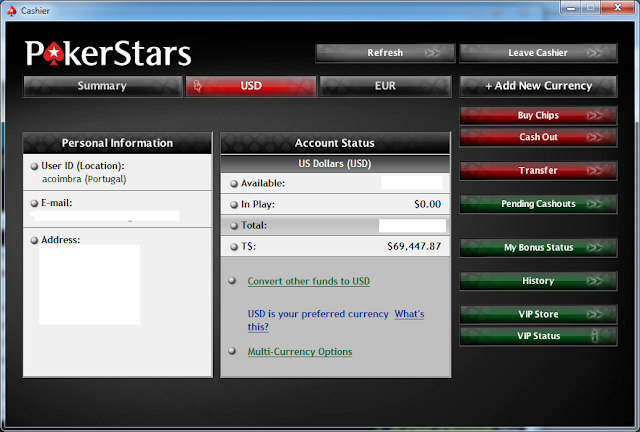 As usual, before the big tournaments on PokerStars, PokerStars will give a deposit bonus! However the best thing to do is to check the rate of exchange daily, before you make the deposit. Any further questions, please contact support@pokerstars.eu - I don't work for the support team at PokerStars! I've not been writting in this blog for a while. I used to write on my portuguese blog and have someone translating it to english, but the person is no longer available for it. With all the grinding and traveling, is too hard to maintan two blogs, so I will not update this one until I get someone to do the translations work for me.